Just minutes outside of the Schweinfurt city limits, farmland takes over and you’ll be at peace with your own spinning wheels, free from car traffic. Typical Bavarian villages like the one in the background crop up by the dozens along every bike path. In the town square of these villages, there is almost always a tourist information center that offers information and booking for local accommodation. Photo by Charles Stadtlander, USAG Schweinfurt Public Affairs. SCHWEINFURT, Germany — The valleys rise up around you green and fertile. A castle looms, perched on a hill like a bird of prey that eyes you as you wind your way along the curve of the river. There are no cars around, and all you hear is the hum of your narrow tires and the steady rhythm of your breathing. Ahead, the river folds back on itself and you pump your brakes to prepare for the sharp turn. 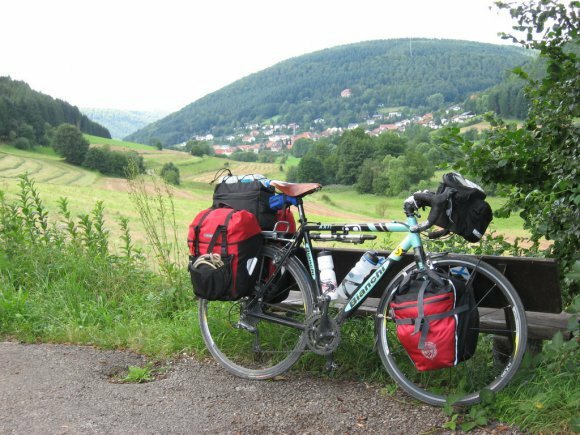 While many looking for a getaway this summer may be asking travel agencies for package deals to crowded beach resorts or booking discount airline tickets to out-of-the-way airports, they are overlooking a hidden gem of a vacation right here in Germany: a self-guided bicycle tour. Simple maps, available here and at most German bookshops, will take you everywhere you need to go. A bike path is called a “Radweg” in German, and though you’ll carry a map with you, the paths are well-marked. You may be able to simply look for the signs with bike logos and arrows and leave your map in your bag. There are 117 official marked bike paths that total more than 5,400 miles of riding in Bavaria. The Main River bike path runs nearly 300 miles through the low, Franconian foothills, passing directly through former U.S. Army locations in Schweinfurt and Bamberg and coming very close to the garrisons in Ansbach, Grafenwoehr, Vilseck and Hohenfels. A short hop on the train will deliver you to the river Main where you can start your journey. For lucky cyclists in Bamberg and Schweinfurt, the headache of vacation traveling can be reduced to a 10 minute bike ride to the riverbank. For more on bike routes and transportation in Bavaria, visit our “Getting Around” page at www.bavaria.army.mil/transportation.